We all have seen the partisan overreach of agitators disguised as so-called judges in the efforts of the Ninth Circuit and other rogue black-robed devils who envision themselves as dictators superior to the President. Some in Congress, globalist Democrats and RINOs, are so enamored with leftist judicial overreach and so desperate to depose President Trump that they now want to transform the position of special prosecutor into that of a Frankenstein monster that can only be turned off by them. 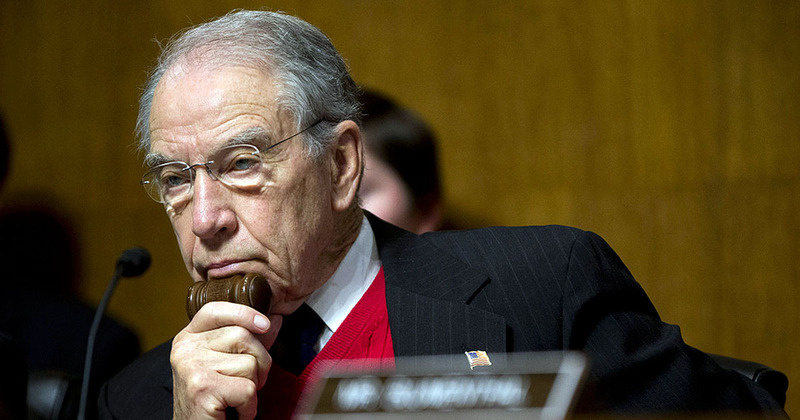 Under pressure from Democrats, the Judiciary Committee, chaired by Chuck Grassley, may consider such a move. Judicially expedient Senators would never consider such an action, particularly with the best of real life evidence ever offered against such a move now being exhibited in the out of control witch hunt of Robert Mueller. His inquisition has deviated completely from the supposed initial purpose and is now a naked attempt to “get President Trump” no matter what it takes. That kind of unconstitutional abuse of power would be supercharged, if Democrats have their way, removing the ability of the executive branch which appointed a special counsel to terminate it. In essence, they will be breathing life into a monster that grows and grows and cannot be killed. It also gives the partisan political hacks in the judiciary and legislature power over the President and whether or not he remains in office, separate from the constitutional impeachment process. Doing so is at odds with the co-equal branches of government that our nation is founded upon and unconstitutional. It’s no surprise that establishment RINO Lindsey Graham is involved or Chuck Grassley, for that matter, who envisions himself as being above party politics in such matters. It’s too bad that there’s not an honest legislator on the Democrat side to serve to a counterbalance to Grassley’s sometimes dangerous “cooperative spirit,” which he’s exhibiting towards the communist progressive Democrats. A group of Democrat senators and one RINO, Graham, called for votes on their bill, which would establish a requirement for the approval of a three judge panel in order for the President whose executive branch appointed a special counsel to subsequently fire him. The group is hoping to capitalize on a recent report in the anti-Trump New York Times to revive their bill introduced in the summer. The biased New York Times reported Thursday that Trump ordered Mueller’s firing in June but recanted after White House counsel Don McGahn threatened to quit in response. Trump shouldn’t have to be assisting in his own suicide. Grassley and most Republicans are dragging their feet on addressing the problems with Mueller, who is one conflict of interest and exposure of corruption and disqualifying bias after another. They’re all too willing to let Trump take the impact of a completely political and contrived political hit. They need to show a little courage and stand up to the communist Democrats who are engaged in a an act of political espionage and sedition against our President. Were Congress doing their jobs, which includes providing oversight of the corrupt FBI and DOJ, both now and for the past 8 years of abuse of power by the corrupt and criminal Obama regime, President Trump might not have felt compelled to protect himself and there likely would have been no Mueller investigation to begin with. RINO Lindsey Graham co-authored his bill with probable 2020 Democrat presidential candidate, and contender in 2016 for the Clinton VP position, loudmouth racist grandstander Corey Booker. A second, similar bill was drafted by anti-Trump establishment tool and open borders stooge of the globalist Democrats, RINO Sen. Thom Tillis (R-NC). He laughably claims his bill preserves executive powers by allowing for the firing but providing a manner of appealing it to a panel of agitator pretend judges. Either way, the creation of a special counsel becomes a death trap for any president, particularly one opposed to the globalist progressives. The judiciary and legislature become the plentiful and easily controlled tools that coups are made of. Grassley has said he will consider one of the bills in committee but the sharks have not yet settled upon which version offers them the most promise of a real overthrow of the duly elected President of the United States. His demeanor and the mood of Republicans in the Senate indicate that the bills aren’t likely to go very far, if anywhere at all. But they do serve as lessons about the type of individuals holding Senate seats for future elections. Both Graham and Tillis are mislabeled Democrats posing as Republicans. They are the enemy of this nation, open borders allies of the communist Democrats. The left forgets how and why we elected Trump. We are the “little” guys who had the guts to go against the swamp creatures, atheists Soros/Obama and Clinton. They forget we have lots of guns and the NRA on our side with more of the same. These liberals need to WAKE UP. Another swamp rat bites the dust, McCabe. What lies is he going to tell the media and Mueller. Nunes’ document needs to be released. That would seal the Dems fate, and they can take along the back stabbers, Gowdy, McCain, McConnell and Ryan among others. those UNIPARTY CREATURES ARE GOING TO KEEP PUSHING WE THE PEOPLE UNTIL WE PUSH BACK, BY A SHOOTING REVOLUTION LIKE OUR FOREFATHERS DID WHEN TYRANNY BECAME UNBEARABLE TO LIVE UNDER EVEN FOR THEM. AND WE’RE ON THE EDGE RIGHT NOW. If these swamp rats find a way to impeach the President, they will have a revolution on their hands. Us “deplorables” elected Trump for a reason. I hope he will live up to his campaign promises. He’s already going back on the deporting of the DACA people and the other illegals. If the proposition passes, 2020 will be a death trap for the Republicans when they lose the votes of the people that elected the President. I have always believed that the “establishment” will do their best to remove Trump. My only question, now, is was he on board or does he want to fight it. Taking both sides on issues, “no deal” to “we’ll see, we may review it” (NAFTA, IRAN, TPP, AMNESTY, CHINA, etc. leaves questions in my mind. Once Pence was given the green light they set up their globalist heir apparent. If Trump was in it for gain and “I tried to be the best ever”, “look what I achieved” he may have been willing to go along, and now give it to the globalists. He’ll go down as the one who tried to save America. If campaign Trump is the real Trump then it doesn’t look like he’s “smart” enough to fight this coup. He allowed them to remove every Nationalist, and fill the administration with “anti” MAGA shills. Mueller should have been shut down long ago. For months now the “committees” have been telling us “this week”.